Robert Kennedy’s 1965 secret investigation led to Jim Garrison to indict Clay Shaw. 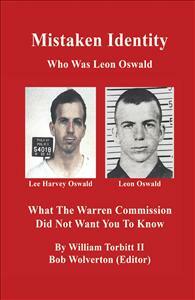 That led to the “Torbitt Document” that revealed the Cabal that killed President F. John Kennedy. Mistaken Identity is not just another “conspiracy” book. It is a critique of the Warren Commission. New forensic and evidentiary material not published, proves that two individuals known as “Lee Harvey Oswald” enlisted in the U.S. Marines in 1956 using the same birth certificate. Recent genealogical research identifies them as second cousins through intermarriage of second-generation French families in New Orleans. It created a nightmare of identity for the FBI. Diligent FBI field agents solved the Kennedy Assassination, but superiors thwarted their efforts. A 1965 secret report by Robert Kennedy reveals the money conduit that killed his brother.